Some appreciation of placental development and structure is necessary to understand its examination and certain pathology. While the placenta shows extensive growth and histologic change in the second and third trimesters, the basic gross morphology is established early in pregnancy, before the end of the first trimester. 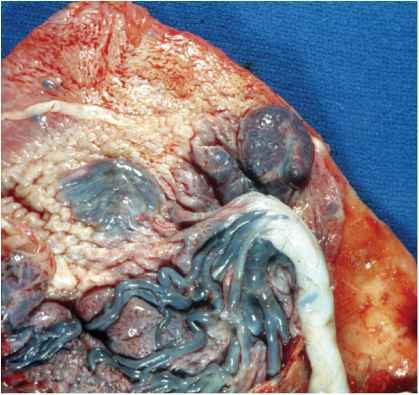 Trophoblastic tissue is the major component of the placenta. By 4 to 5 days after fertilization, trophoblasts differentiate from the external cells of the morula as it becomes a blastocyst. The trophoblastic cells proliferate rapidly and surround the inner cell mass, covering the entire surface of the blastocyst. Attachment to the endometrial surface and implantation occur at 5 to 6 days, usually in the upper part of the uterus. Implantation is interstitial and the blastocyst becomes totally embedded in the endometrium. As the developing conception grows, it protrudes into the endometrial cavity. The endometrial stroma undergoes decidual change. 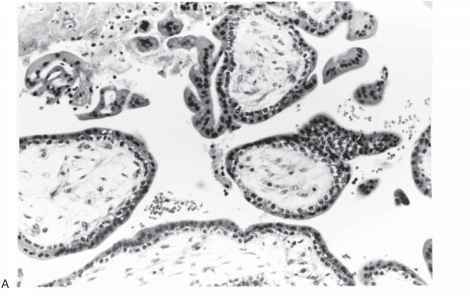 At first the entire gestational sac is covered by chorionic villi (Figure 2.1, Figure 2.2). 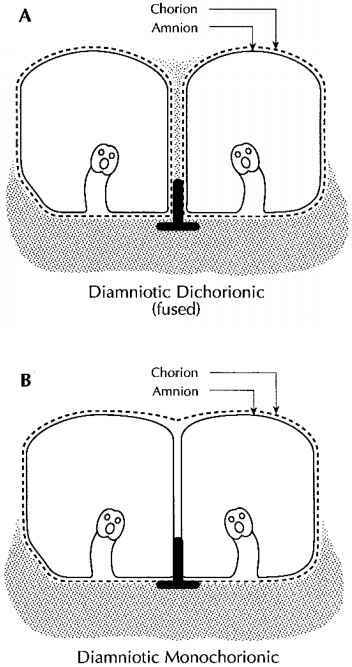 As the sac enlarges, its surface thins, forming the peripheral membranes which are composed of decidua capsularis, atrophied chorion, and amnion. The definitive placenta is left at the base. With continued growth of the conception there is apposition of the membranes with the decidua vera of the opposite side of the uterus, but no true fusion. The fetal-placental circulation begins at about 9 days when lacunae form in the syncytial trophoblast. 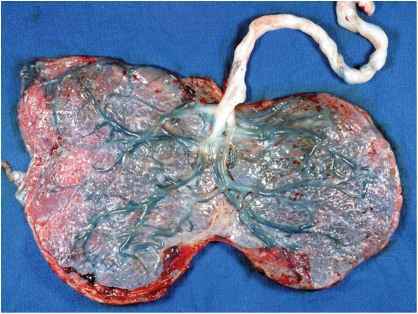 By days 10 to 12 these lacunae link with maternal blood vessels which have been eroded by trophoblastic invasion. The intermediate trophoblastic cells are responsible for invasion into the uterine wall and maternal vasculature. The primary fetal chorionic villi have formed by 14 days and consist of cords of cytotro-phoblast covered by syncytial trophoblast. Shortly after there is invasion of avascular extraembryonic mesenchyme from the embryonic body stalk into these columns forming secondary villi. Capillaries develop within the villous stroma and form networks by 20 days (tertiary villi). Figure 2.1. This embryo of 6 developmental weeks was removed in situ during a hysterectomy for cervical carcinoma. The decidua has been partially removed to reveal the chorionic villi which cover the entire early gestational sac. Part of the chorion has also been dissected showing the amniotic sac containing the embryo. Figure 2.2. 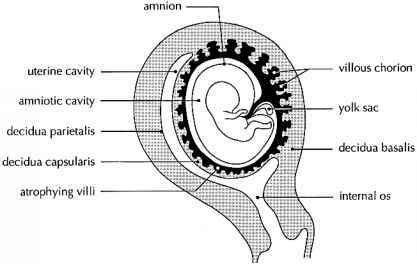 The embryo lies within the chorionic and amniotic sacs. Note the yolk sac between them. The capsular chorionic villi associated with the evolving peripheral membranes are undergoing atrophy creating the discoid placenta at the base into which the cord inserts. Figure 2.3. Histologic maturation of villi (A) Very early first trimester villi show abundant stroma without vessels. Two layers of trophoblast (cyto and syncy-tiotrophoblast) are present, without syncytial knots. (B) At the same magnification, term chorionic villi are much smaller and show little stroma. There are numerous blood vessels and only syncytial trophoblast is visible on the surface with numerous knots. secondary and tertiary stem villi and finally distal terminal villi. "Anchoring" villi are present at the base of the placenta. Normal maturation of villi entails several features. There is progressive diminution in villous size and stromal content with an increasing portion of the villus composed of blood vessels. The syncytiotrophoblast nuclei become aggregated into "knots," and the cytoplasm thins over vessels forming vasculosyncytial membranes. The originally prominent cytotrophoblastic layer disappears and by term few cytotrophoblasts are recognized on light microscopy (Figures 2.3A,B). The shape of the placenta is quite variable. Generally it is round to ovoid and about 18-cm to 20-cm diameter by 1.5-cm to 2.5-cm thick at term. Failure of atrophy of capsular villi leads to succenturiate lobes (Figure 2.4, Figure 2.5). Bilobate placentas result from uterine sulcal implantation (Figure 2.6), while unusually shaped often multilobate placentas may be due to uterine cavity abnormalities (Figure 2.7). A diffuse thin placenta without free membranes is extremely rare and known as placenta membranacea. (Figure 2.8). This may represent a shallow implantation with persistence of virtually all the capsular villi. While these alterations should be described, they are of little significance except for potential problems related to the velamentous vessels that often accompany them and placenta previa. Figure 2.4. Succenturiate lobes are formed if some of the capsular villous tissue fails to atrophy during development. Such tissue can potentially be left behind at delivery leading to bleeding from retained placenta. True succenturiate lobes are connected to the main placental mass by velamentous vessels which can be damaged. This slightly immature placenta shows at least four such lobes, one large and three small. Succenturiate lobes often become infarcted or fibrinous. One of the small lobes is yellow and atrophic (arrow). Figure 2.5. The term "partial" lobes can be used to help describe some of the irregularities of outline. These are lobe-like marginal placental areas which are connected by bridges of villous tissue and do not show velamentous vessels. Figure 2.6. This mature bilobate placenta has two distinct lobes of roughly equal proportions. The umbilical cord inserts between them, velamentously into the membranes. Although this resembles a placenta with a large succenturiate lobe, this configuration more likely arises through a different mechanism. Implantation in a lateral uterine sulcus will lead to relatively equal growth along the anterior and posterior walls. Figure 2.7. An unusual uterine shape, scarring, or intracavitary lesions may be reflected in the placental outline. Such abnormalities impede placental growth in certain areas and the remaining tissue extends into other regions. 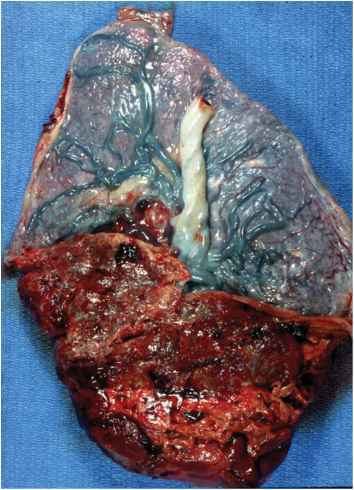 This large irregular placenta suggests an abnormal uterine cavity. Figure 2.8. This is a very large thin immature placenta with villi covering the entire sac except for small areas of membranes including an enclosed window. It likely covered the cervical os. The placenta was cut through at Cesarean section and was extensively disrupted. When implantation is low in the uterus the point of membrane rupture will be near the placental edge in a vaginal delivery. True placenta previa develops with a low implantation when placental villous tissue covers the cervical opening (Figure 2.9). Complete previas are usually delivered by cesarean. This process is often difficult to confirm on placental examination, particularly if there has not been significant clinical bleeding. The maternal surface may show old or fresh hemorrhage (Figure 2.10) or merely a 1-cm to 2-cm circular deposition of fibrin in the region of the cervix. Figure 2.9. 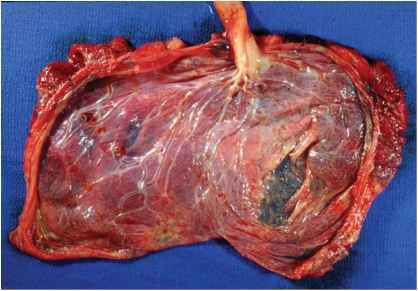 This gravid supracervical hysterectomy was done for placenta previa with excessive maternal bleeding at a nonviable gestational age. Note the pale villous tissue completely covering the region of the cervical os at 6 o'clock cervical os and extending around the entire lower uterine segment. The placenta could not be manually removed from the uterus and there was extensive placenta accreta. Figure 2.10. 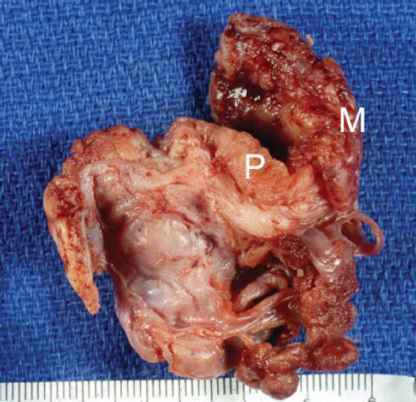 This near term placenta with complete placenta previa recapitulates the shape of the lower portion of the uterus, being folded back on itself at the cervix. 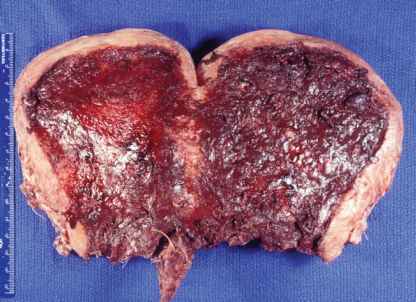 There is brown, old hemorrhage in the area of the os due to placental separation. No accreta was present. Figure 2.11. This opened post-partum uterus shows extensively invasive adherent placental tissue in the lower segment. Thus this was a placenta previa that had partially separated as well as invaded into the muscle, an increta. Accreta, previa, and placental separation are frequently seen together. Figure 2.12. 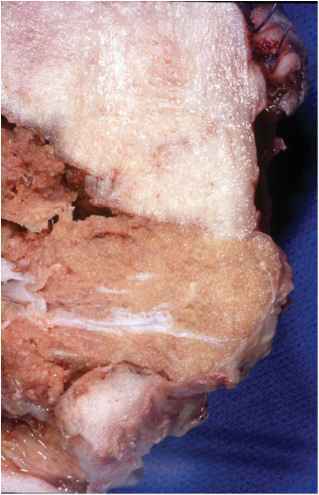 This fixed postpartum hysterectomy specimen reveals retained pale placental tissue invading focally nearly through the wall of the uterus, with thinning to less than 1mm of serosal tissue (placenta increta). Figure 2.13. This uterus still contains the placenta as it could not be removed readily at delivery and focally the placental tissue has perforated the myometrium (arrow). Fibrin and organization of the clot were present on histology. The adjacent thinned lower uterine area appears somewhat blue from the closely underlying placental. An unsutured vertical cesarean section incision is present. implantation. Accreta is most easily identified in hysterectomy specimens. It is usually not possible to make the gross diagnosis of symptomatic accreta and its more invasive forms in a delivered placenta, and only rarely on placental microscopy. 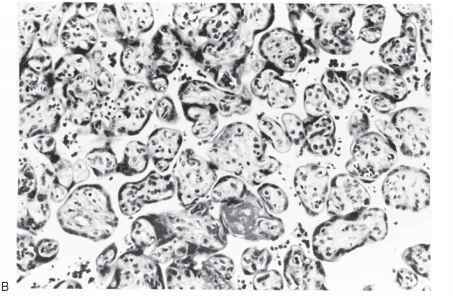 Accreta may be found both grossly and microscopically in post-partum currettings for bleeding (Figure 2.14). Partial myomectomies of regions with increta are occasionally performed (Figure 2.15). Abnormal adherence of the placenta is not the only cause of life threatening postpartum hemorrhage. Uterine atony is another frequent cause of postpartum hysterectomies (Figure 2.16). Figure 2.14. 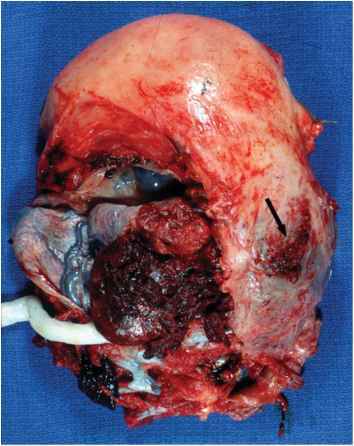 This is from the post-partum currettings in a woman with bleeding 3 weeks after delivery. 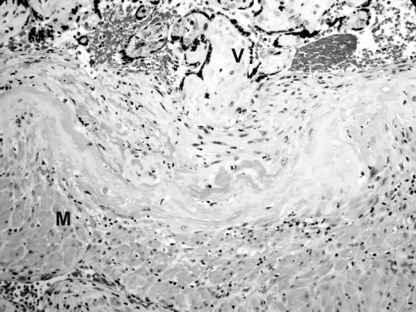 Fibrotic avascular villi (V) can be seen directly adjacent to myometrium (M) without intervening decidua. Figure 2.15. This piece of myometrium was resected in a woman with a localized area of accreta. The placental tissue invades well into the muscle. Figure 2.16. 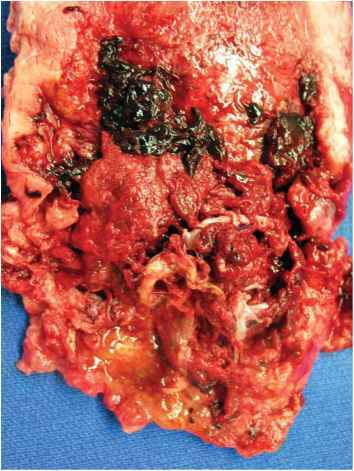 This postpartum supracervical hysterectomy was done for uncontrollable bleeding after delivery. The myometrial wall is thin and the fresh uterus was floppy. No adherent placenta was identified on thorough sectioning. Does gestational sac turn into amniotic sac? What is the difference between yolk sac and gestational sac? 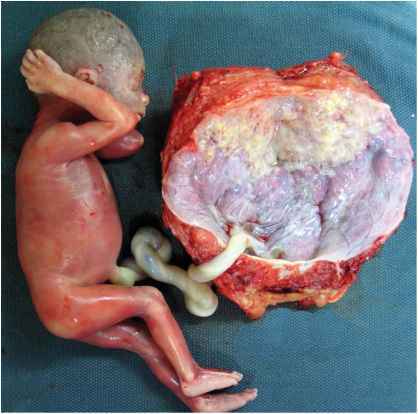 Is the amniotic sacthe gestational sac? What is a grossly disrupted placenta? Does the yolk sac turn into the placenta? What happens if the gestational sac lies below the cavity? Why placenta breakup with uterus? What is a small succenturiate lone on upper posterior wall? Are the chorion and the gestational sac the same thing? What covers the gestational sac in pregnancy? Is a endometrial sac the same as a gestational sac?